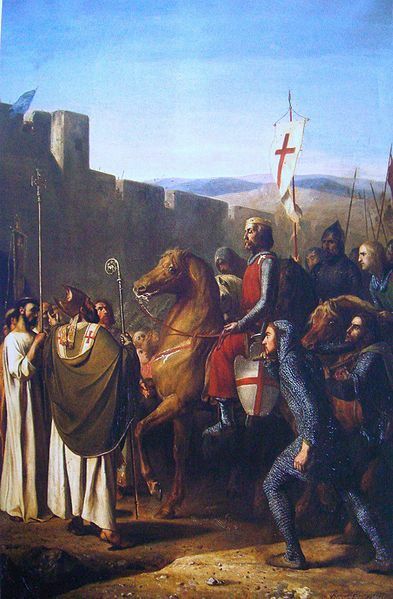 The Battle of Dorylaeum took place during the First Crusade on July 1, 1097, between the crusaders and the Seljuk Turks, near Dorylaeum in Anatolia. At the end of June the crusaders marched on through Anatolia. They were accompanied by some Byzantine troops under Taticius, and still hoped that Alexios would send a full Byzantine army after them. They also divided the army into two more easily-manageable groups, one led by the Normans, and the other by the French. The two groups intended to meet again at Dorylaeum, but on 1 July, the Normans, who had marched ahead of the French, were attacked by Kilij Arslan. 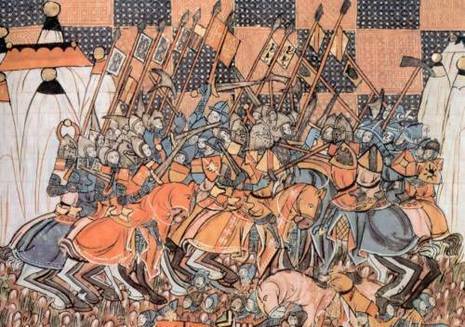 Arslan had gathered a much larger army after his defeat at Nicaea, and now surrounded the Normans with his fast moving mounted archers. The Normans "were deployed in a tight-knit defensive formation", surrounding all their equipment and the non-combattants who had followed them along the journey, and sent for help from the other group. When they arrived, Godfrey broke through the Turkish lines and the legate Adhemar outflanked the Turks from the rear; the Turks, who had expected to destroy the Normans and did not anticipate the quick arrival of the French, fled rather than face the combined crusader army.